Timket is the most colorful holyday in Ethiopia fall 19 January. The holy tabot, the replica of the Ark of the Covenant is moved from each church around the country before the celebration and taken to the central. The following day morning the church officials resplendent in their gorgeous regalia assemble around the tabot and sprinkle holy water over all the Christians present and relieve the renewals of their vows. 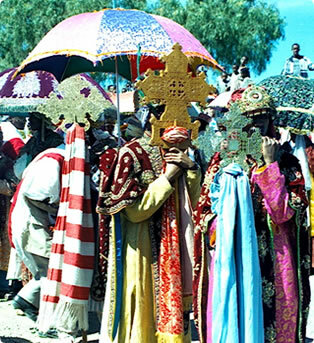 Timket, feast of Epiphany is the greatest festival of the year falling on the 19 January just two weeks after the Ethiopian Christmas. It is actually a three-day affair beginning on the eve of Timket with dramatic and colourful processions. The following morning the great day itself, Christ’s baptism in the Jordan River by John the Baptist is commemorated. Since October and the end of the rains, the country has been drying up steadily. The sun blazes down from a clear blue sky and the festival of Timket always takes place in glorious weather.